Our London-based company is occupied with piano removals. Our professional movers can deal with various sizes and types of pianos such as upright pianos, grand pianos and keyboard instruments, pianos that weight 800 lbs and more, etc. The idea of professional removals is to ensure safe transportation of these items. The first step is to calculate how heavy the piano is. Without knowing its weight, proper and safe removal may not be done. Based on this, a team of movers is assigned to do the work. As many men as necessary pull the musical instrument out from the wall so that it’s easier for them to lift it. They put it over a dolly. Using furniture or moving pads, they cover the instrument to protect it against scratches. Next, they slowly move it out of the house while being careful not to damage it. Thresholds and stairs are a key point. Since most houses have stairs, movers use a ramp to cover the stairs so that the moving process is much easier. The men then load the piano on a truck, securing it with straps. The piano can be safely transported to another location. When they get to the location, the movers remove the straps and unload the piano. If it has to be placed in another building, the same procedure is repeated backwards. The instrument is carefully moved inside the building, using a dolly. Once in place, the moving pads can finally be removed. When moving pianos there are a few things to consider such as weight and size, type of piano, material and the manpower needed. Some parts of this musical instrument are decorative and they serve no purpose other than to make it look beautiful. They are delicate and should be treated with care. Another thing to take into account is piano keyboard and all internal parts. The instrument shouldn’t be shaken in any way as it may cause damage. Our company is a professional piano transporter and we know how to deal with the above things. 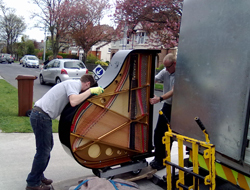 Get in touch with us if you want to have your piano removed by professional movers.